On your fist visit you will be greeted by Kim our cheerful front desk person. 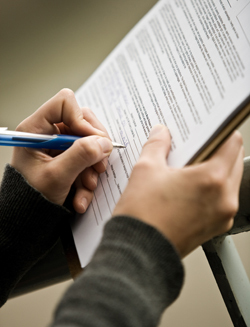 You will be asked to fill out the necessary short forms for your particular situation. Whether you are filing insurance, on the job injury, a car accident or if you would like to pay cash without a third party payer. If you like to fill out the short forms prior to entering the office we can fax, email or mail the forms to you. After completing the forms Allison will give you a brief tour of the office and you will receive a health history (consultation). You will be asked certain questions about your current situation that brings you into the office. During the health history we will determine if there is recent test which we my receive for you to help with the diagnosis. These test my include recent x-rays, MRI’s CT scans or EMG’s. Your condition may require us to take X-Rays at the office. If you do require X-Rays rest assured you will receive only the X-Rays required on our new digital high frequency x-ray unit. Minimizing your exposure and increasing the quality of your X-ray. That will complete your fist day. I will then analyze your findings to meet with you on your next visit to fully explain your diagnosis, how long your treatments will take, how many treatments you will require and the cost of each treatment. The first visit generally takes 30-40 minutes. Don’t wait! Contact Chapel Hill Chiropractic today to get started with care.